Young Ryan Braun isn’t smiling because “intent with Buick-like seriousness” are his factory settings. 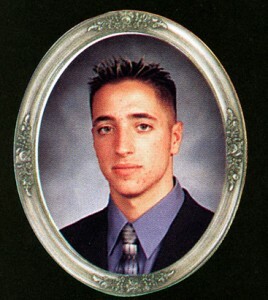 Young Ryan Braun doesn’t like posed senior portraits. Young Ryan Braun doesn’t like portraits. Young Ryan Braun is worried about some things but not Y2K. Young Ryan Braun will go to prom and get under-the-bra action from Tiffany Blankenship and Jen DeLuca. Young Ryan Braun’s prom date will be Amber Symanski. Young Ryan Braun will sometimes work out while listening to “Country Grammar,” which he owns on compact disc. Young Ryan Braun’s acne medication doesn’t work perfectly, but everything else does. We hoped you liked reading Young Ryan Braun by Dayn Perry! Considering his current taste in T-shirts, this seems just about right. Also, this ruled.